Humanity's enduring spirit of adventure has been a prime inspiration behind the first explorer yacht in Heesen’s 41-year history. The 57 metre model was briefly revealed at the 2018 Monaco Yacht Show but the yard remained tight lipped about the steel explorer named XVenture. Now Heesen's director of sales and marketing Mark Cavendish and design studio Winch Design have opened up about the model. A deliberate strategic push to tap into the emerging explorer yacht sector was a key motivation behind the concept which, Cavendish admitted, marks “a major departure” for the yard. Central to this is Cavendish’s belief that “the hunger to discover new worlds runs deep in our DNA” combined with the realisation that many existing Heesen superyacht owners were venturing more and more to far flung destinations. “Heesen has never been a shipyard to rest on its laurels and so it made sense to us to add an explorer yacht to our burgeoning portfolio,” Cavendish said. Cavendish, along with Winch's head of yacht exteriors Andreas Iseli and yachts exterior designer James Russell, have revealed more about the capabilities and aesthetic of the explorer. The yacht will be “as much at home in the wilds of Alaska as the glamorous port of Monaco,” Cavendish said. Inspired by the natural world, an environmental connection will sit “at the heart of the yacht,” Iseli and Russell said, governing “each design decision”. Extensive use of glass will characterise the exterior, offering owners and guests far reaching views of the natural landscape. A vertical bow and angular hull will create “a confident powerful aesthetic”, a direct result of the big increase in demand for this kind of “distinctive” profile, Iseli and Russell said. Other key features will include a three-deck crystal elevator, winter garden sitting beneath a helideck, convertible guest cabins and a number of large tenders. Iseli and Russell also revealed more about XVenture’s huge 1,400GT interior. 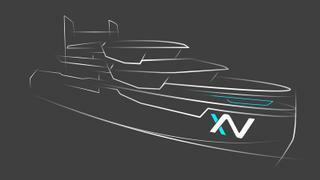 “XVenture will have a very unique layout for a relatively ‘small’ yacht and will have an enormous interior volume in comparison to other yachts of this length." 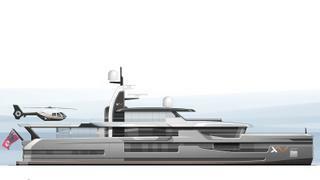 Additionally, XVenture will feature vast storage spaces and combine an explorer’s go-anywhere capability with the feel of a “traditional" superyacht.